k-2 Thursday is sold out. We have initiated a Friday Montclair Class, same time as Thursdays! We are joining efforts to partner MES and Oakland Park and Rec. Classes will be held at the Oakland Park and Rec Tennis courts. If your child attends MES, our coach will pick them up from MES, walk them to the courts, and if need be, take them back to AT at MES after class. Join in on the fun of learning and playing tennis at school with both your classmates and friends! ANTS brings everything to your school, and is ready for your children to have fun and play tennis! We also are here to develop a progressive program at your school that will continue to foster positive development in both the game of tennis and sport of life! Progressive Curriculum: If you have been with us before we will continue to progress you! ANTS Racquets (for extra cost). Your child will be assigned a racquet that fits him/her if purchased through ANTS. NO oversized racquets in ANTS Tennis! This makes it easier for you child to learn to swing and play! ANTS Trained and Qualified Coach. ANTS coaches focus on your child being safe and having FUN first! 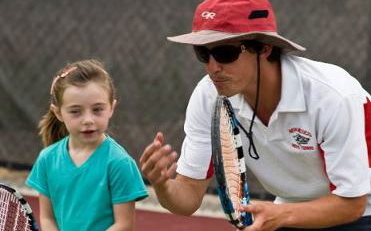 Second, ANTS coaches focus on having your child learn the game and get up to speed to play tennis! We always progress! ANTS age-appropriate racquets cost $27.5. ***Kids will be picked up from MES Campus, and if need be, dropped back off to AT for BOTH classes! We will be following the MES after school schedule for days off, etc. Reminders will be sent to parents by our coach. Classes will be held at the Oakland Park and Rec tennis courts near MES on Mountain Blvd. Let's do a Friday Class!